Beautiful colored leaves change with the seasons and this walk along Cabot Trail in Cape Breton Highland National Park in Nova Scotia, Canada is picture perfect. 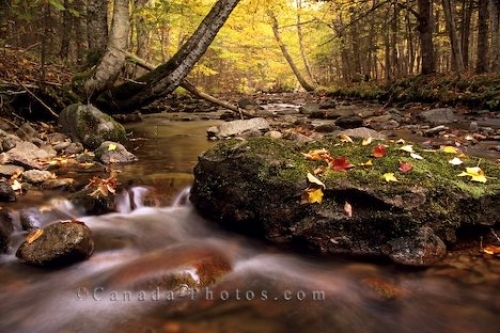 MacIntosh Brook flows through the middle of this forest as leaves drop from the towering trees creating a stunning nature autumn scene. Picture of MacIntosh Brook in Cape Breton Highland National Park in Nova Scotia, Canada.